Too many people go about it all wrong, and they end up ruining their reputations, or they get banned and lose all of the progress they have made. There’s no sense spending months building a following and a reputation if you’re just going to get banned and lose it all. 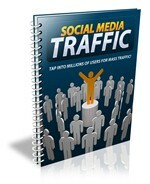 In this report, I’m going to teach you some of the secrets of effective social marketing. You’re going to learn how to build a solid, profitable traffic and revenue stream by making use of the massive user bases of popular social networks, and how to maximize your profit potential.